The theme of the Pittsburgh Steelers season has been narrow victories against inferior opponents. Countless times, including the past month and a half, the Steelers have battled their way through mediocre play at times that have resulted in a last second field goal by Chris Boswell to snag a late victory. 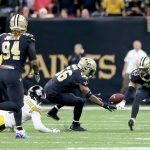 That style of play led them to an 11-2 record and the top seed in the AFC as they entered yesterday’s game against the New England Patriots at Heinz Field. Unfortunately, the Steelers couldn’t’ pull another victory out, as a late drive came up short, and the Patriots held on for a 27-24 win. Antonio Brown left the game in the second quarter and did not return. But despite losing his biggest weapon, Ben Roethlisberger was still effective against the New England defense, tossing for 281 yards and two touchdowns. Ju Ju Smith-Schuster had 6 catches for 114 yards and a touchdown, and Martavis Bryant stepped up with 4 catches and 59 yards. Le’Veon Bell had a good game on the ground, tallying 117 yards on 24 carries and a touchdown. The Patriots took the lead in the first quarter on a 1 yard touchdown run by Ron Burkhead, capping off a 77 yard drive. Pittsburgh answered with a 18 yard touchdown connection from Ben to Eli Rogers, tying the game after the first quarter. Field goals by Boswell and Stephen Gostkowski kept things tied, and a pass from Ben to Bryant made it 17-10 at halftime. After the two teams traded touchdowns in the third quarter, Pittsburgh led 24-17 heading into the final quarter. But Tom Brady and the Patriots responded as they always do with the game on the line. A Gostkowski field goal made it 24-20, and an eight yard touchdown run by Dion Lewis capped off a 77 yard drive to put the Patriots in front 27-24. Brady’s favorite target in the second half was Rob Gronkowski, who had nine receptions for 168 yards. The Steelers had an opportunity to win this game in the final moments once again. After a huge play by Smith-Schuster, Pittsburgh was in the red zone with plenty of time to spare. Ben then connected with Jesse James with what appeared to be (and was called on the field) as a touchdown. However, after an extensive review, the referees stunned the Heinz Field crowd by overturning the call. Two plays later, Ben threw an interception in the end zone to end the game. Of course, the referees’ decision to overturn the touchdown at the end of the game has been grabbing the majority of the headlines. Unfortunately, though, that is not why the Steelers lost this game. They lost this game because of their poor play-calling down the stretch. When they had the lead in the fourth quarter, the possession before the Patriots moved down the field and scored what would be the game-winning touchdown, the Steelers were extremely conservative with their play-calling. This is a game you must win if you want a good shot at making it the Super Bowl. 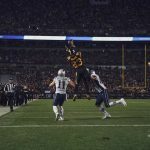 The Patriots are nearly unbeatable at home in the playoffs, and Pittsburgh had an opportunity to ensure that the AFC title game would go through Heinz Field. 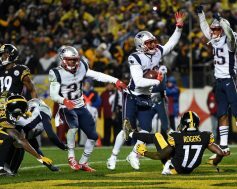 Now, if the Steelers do wish to make it back to the Super Bowl, they will need to go through the Patriots at Gillette Stadium. After yesterday’s loss, the next two weeks are extremely important for the Steelers. They’ll lace up the cleats on Christmas Day for a matchup against the Houston Texans.